Our street is a busy major road but neat, clean and orderly. One day, our street was suddenly infested with gatecrashers. They wrecked havoc, used their toys to slit our road, caused mayhem traffic and went on a marathon rampage to injure our strong road. And then, they moved in and became instant neighbors. They were always awake and noisy. I'm talking about the MWSS or as I like to consider them, the city gophers, who destoy the roads and sidewalks, dig deep holes to install some pipes, and leave the scene of the crime with an ugly scar. Without any prior warning, several officials with the MWSS uniforms came by the dozens, followed by another dozen or so workers containing the area with "caution tapes" as if our neighborhood is being converted into a containment facility to prevent any outbreak. 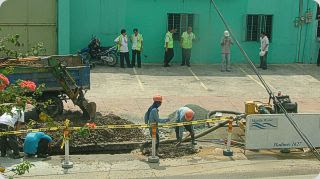 Then the noise continued non-stop as the workers started drilling away a part of the road followed by our sidewalk. They also parked a bunch of their company vehicles across our street, some pickup trucks, vans and company cars followed by machinery equipment and power supply. The last and surprising addition to their stake, was a mobile trailer, complete with windows, blinds, air conditioning and a water dispenser placed near the entrance. It seemed like that was their new headquarters. 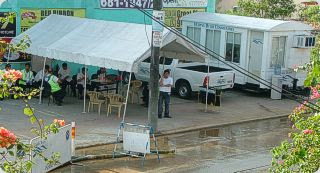 Beside this was a huge tent with lots of monoblock chairs serving as their secondary outpost. In a couple of hours, our once, quiet and peaceful road was transformed into an MWSS boot camp. What was disconcerning was that we the homeowners, residents and neighbors weren't informed of what was happening. So most of us was just looking at what was going on as it progressed. We asked them what happened and it seems that a major water pipe got busted in our area which is why they need to replace it. When we asked if our water supply will be affected, we were told that they'll turn it off in the evening. Guess what ? Before lunch that day, were already waterless. Our disgruntled neighbor was furious cause she was cooking that time and needed water. It was also strange to see a whole lot of officials in the scene watching on, discussing and at some points of the day, looked like they were celebrating a party with food and drinks. Usually, I'd see only workers at the scene but this seemed out of the ordinary. Well it's been a week now and we've been enduring the sounds of drills, a regular honking of horns due to traffic and the inconveniency of backing up our car to whats left of our road. At night, the road is still bright because their powerful search lights. I woke up at 3 in the morning one day and still saw them working. If us homeowners were only properly informed of what was going on, as well at their work would be clean and neat, I'd have no problems with them. I'm just looking at the positive side to this, being, our water source is being upgraded. I just fear that what I've witnessed with some areas may be the fate of our road as well. When they're finished, there's a big chance that our road will never look the same again... sort of a facelift for the worst.